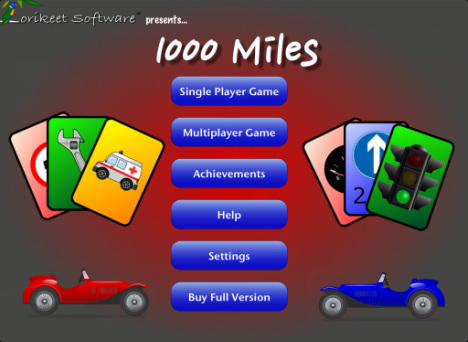 1000 Miles is a game for the iPad, iPhone and iPod Touch.1000 Miles is based on a French card game called Mille Bornes (1000 stones). It is simple to learn and play, even for children, and is very addictive. You may need to use quite advanced strategy to maximise your score though. The premise of the game is that you are in a car race. Each hand is either 700 or 1000 miles long, with the first player to reach 700 miles having the option to extend the race to 1000 miles. 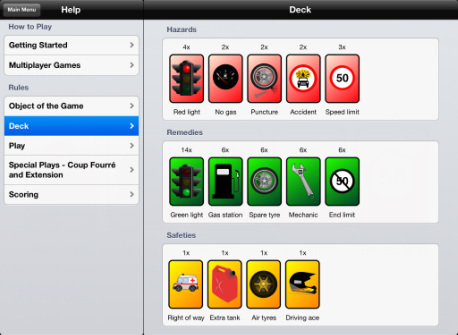 The game uses a special deck of cards which includes distance, hazard, remedy and safety cards. Hazards are played to slow or stop your opponent's progress. Remedies are played to remove hazards applied by your opponent and safeties are used to prevent hazards. Best of all, it's free, but some features are not enabled unless you purchase the full version unlock. 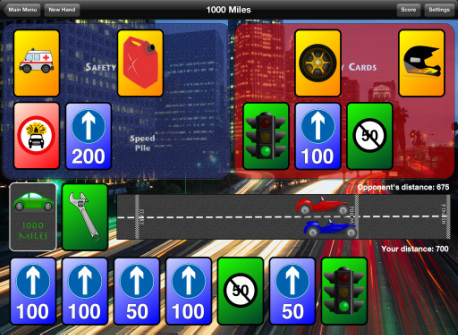 1000 Miles is fully compatible with the 4 inch screen of the iPhone 5 and is universal, so you can run the same app on your iPad, iPhone or iPod Touch. It requires iOS 6.0 or higher. 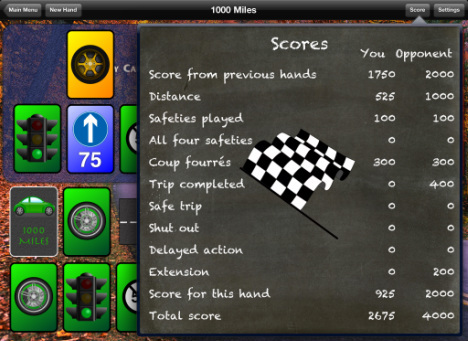 1000 Miles is available from the App Store for FREE! What do you get in the free version? The free version includes all features except for the ability to extend the races from 700 to 1000 miles and multiplayer support. Upgrade to the full version is available via in-app purchase and costs only US$0.99 . © 2013 Emma Whan. Lorikeet Software is a registered business name.